There is considerable lore attached to building with earth. Being in some likelihood the oldest construction technology on the planet, there has been plenty of time for oral traditions to be formulated and passed along with no written record. For evidence of this we can trace the use of wooden belts, or bond beams, embedded in adobe walls as strengthening elements. These are important in seismic zones from Kashmir to Morocco and during the early period of European contact were introduced to the New World. Though their existence and purpose was never, as far as I know, documented in the literature of the day, this technology found its way into Northern New Mexico where the seismic threat is very low indeed. Tradition told people to build a certain way, without explaining why. And we still hear the old dicho that both entertains and instructs, "Un adobe sin paja es un adobe sin alma" (An adobe without straw is an adobe without soul). Oral tradition aside, mud buildings are frequently mentioned, celebrated, and sometimes derided in prose and poetry. The biblical Book of Exodus tells us that the Israelites were forced to build two cities using sun-baked bricks held together with straw. As we know, Pharaoh in this story sees his slaves as lazy for wanting three days off to make sacrifices in the desert and so withholds the straw but demands that their quota of bricks not be diminished. The straw/soul connection here takes on a new dimension, as a few souls were no doubt released from their mortal coils for want of straw. To wage eternal warfare with the fire and flood. Now there is a big vision! Imagine an empire of mud buildings appropriately fated to resist the forces of nature forever! I found the rest of the poem so-so. as they build this folly, this bridge? A profane, vain, useless labour. blocked their way. It is God's will. Here, mud trumps stone with the blessing of the Almighty and a little help from a madwoman. The poet Yeats dreamed of going back to the wild island of Inisfree near Sligo, in Ireland, to build a home of mud and wattles. I don't know if he ever built his earthen house, but he is buried near Inisfree and his headstone reads, "Cast a cold Eye, On Life on Death, Horseman pass by." Yeats seems a little despondent here, and I wonder if his retreat to a wild place and his desire to build with a material as humble as mud were not a call to simplify. Mud, in its guilelessness, does have a way of making one happy. Swish! Over the logs of the ditch-bridge, where brown water is flowing full. There below is the pueblo, dried mud like mud-pie houses, all squatting in a jumble, prepared to crumble into dust and be invisible, dust to dust, earth to earth. That they don't crumble is the mystery. That those little squarish mud heaps endure for centuries after centuries, while Greek marble tumbles asunder, and cathedrals totter, is the wonder. But then, the naked human hand with a bit of new soft mud is quicker than time and defies the centuries. But enough of these erudite literati and on to the view of the common man. As long as adobes are still being made, the lore and the literature surrounding them will develop and disseminate. I relate here a modern anecdote whose veracity I can attest that, for better or worse, may influence our understanding of earthen buildings. 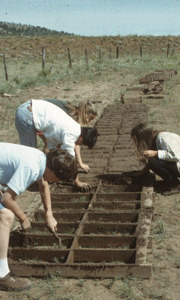 Some years ago during a summer workday on the church in La Cueva, just south of Mora, I had a group of volunteers shed their footwear and mix adobe in the "traditional" manner. I had prepared a crater of mud by soaking the local, reddish soil overnight and had tossed the requisite amount of straw over the surface. The group, a few regulars from Santa Fe, some students from the United World College in Montezuma, and some from nearby communities were eager to feel the cool mud squishing between their toes. Present but not participating was Julio Romero, the six-year old son of the mayordoma, or church caretaker, in nearby Chacon. Julio had a vivid imagination and an uninhibited manner (one of his regular pastimes was to stand on the curb in Lincoln Park in Las Vegas and attempt to pee on passing cars). About 20 minutes into the mud-mixing, just as everyone had gotten into the rhythm of the dance and the consistency of the mud was turning delightful, Julio walked by and with a countenance of alarm stated, "Eeeeeee, watch out for the adobe bloodsuckers!" The locals smiled and pressed on, but one by one within ten minutes everyone else had left the pit with looks of both suspicion and embarrassment. They were pretty sure there was no such thing as an adobe bloodsucker, but there was just enough doubt inspired by the intensity of the warning to force prudence to take the upper hand. Word spread, especially among the college students, and rubber boots became the norm thereafter. It could be that somewhere, in one of the countries that is home to a graduate of the United World College, a new chapter has been added to the lore of adobe, one that prescribes, when mixing the mud, protection against the insidious adobe bloodsucker.